Michelle Forbes’ recent portrayal of a grief-stricken mother in the AMC series The Killing earned her an Emmy® nomination for Best Supporting Actress in a Drama Series. Prior to that, Forbes starred in the groundbreaking Alan Ball series True Blood for HBO. ... Más informaciones Additionally, she starred as Kate Weston in the HBO series In Treatment, opposite Gabriel Byrne and Dianne Wiest. She's also had featured roles in popular series such as Chicago Fire, The Returned and Orphan Black. Michelle now stars as Valerie Edwards, a no-nonsense Internal Branch Chief for the CIA, in the hit series Berlin Station. 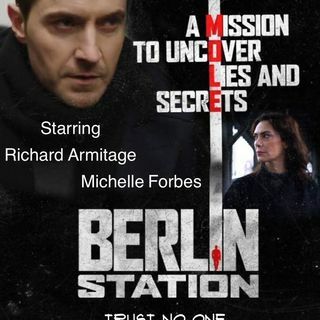 The contemporary spy series follows Daniel Miller (Richard Armitage), an undercover agent who has just arrived at the CIA station in Berlin, Germany. Miller has a clandestine mission: to determine the identity of a now-famous whistleblower masquerading as "Thomas Shaw." As he dives deeper into the German capital's hall of mirrors, he uncovers the threads of a conspiracy that leads back to Washington, D.C. The talented cast also includes Richard Jenkins, Rhys Ifans, and Caroline Goodall.